From October 2017 I will be using the treatment room at The Mercat Gait Centre, Prestonpans. Tuesdays 10-12am, 6-8pm, Fridays 10-12am. To book a session in Prestonpans call me on 07986 555275. 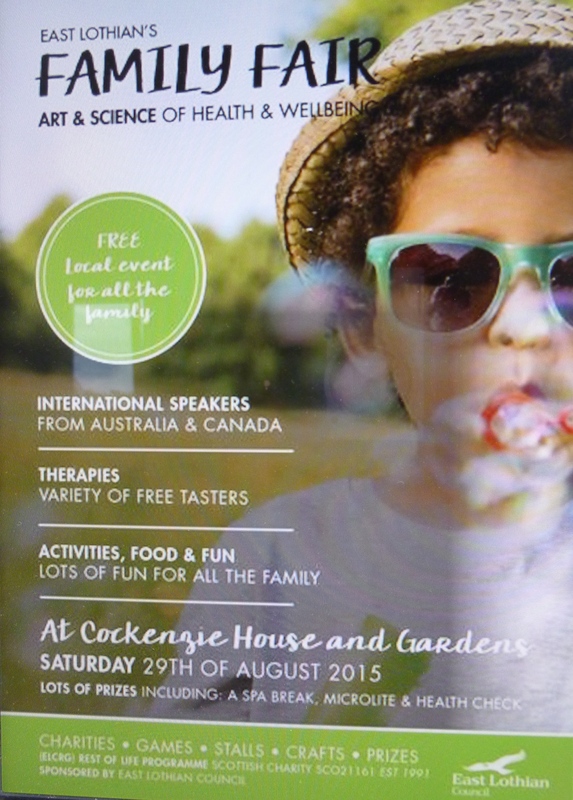 I will be offering ‘taster’ sessions of Bowen at the Family Health Fair at Cockenzie House on Saturday 29th August 2015 from 10am…..
I’m very excited to be opening Studio 2, my new Therapy Room at Cockenzie House & Gardens on Saturday 28th February 2015. June special offer – £5 off Ear Candling………. Bowen Therapy in May’s Natural Health magazine…..
Reading through an old ‘Healthy & Organic Living’ (December 2008) magazine, I came across an article on Bowen that I’d completely forgotten about……. On Sunday 2nd March I will be at Why Not North Berwick – come along for a £5 taster of Bowen and Indian Head Massage or just pop along to get more info or have a chat. I will also have gift vouchers available – why not treat a special Mum for Mother’s Day. As an introductory special offer for the rest of January and for February I will be offering Ear Candling at the special rate of £20 instead of £27, the price it will be from 1st March. Ear Candling is a wonderfully relaxing treatment for all, especially if you have any Ear, Nose & Throat issues – contact me for more information! Have you started the year with aims, resolutions or exciting plans? Remember to set achievable goals and congratulate yourself on small steps forward! One of my aims is to further my knowledge and skills ; attending Bowen workshops and other courses. Hopi Ear Candling (also known Thermal Auricular Therapy) is a pleasant and non-invasive treatment of the ears, it is used to offer real and calming benefits for many problems and conditions associated with the ear, nose and throat areas. The therapy is widely used as an alternative to conventional treatments such as antibiotics & ear syringing. A Hopi ear candle treatment is a deeply relaxing, calming and soothing experience. I also hope to increase my client base (so feel free to pass my name on to friends and family!)! Friday & Saturdays by arrangement. Haddington Herbals is extending their shop and so will no longer have their treatment room available from Feb 2014. I will be treating from Longniddry and also offering mobile appointments – I come to your home. I will keep you posted when I find another clinic to work from. It’s a beautiful, sunny, wintery East Lothian day as I write this. Friday & Saturday by arrangement. Haddington Herbals will no longer have a therapy room from the end of Jan 2014. From Feb, I will be treating either from Longniddry or mobile (i.e I come to you!) on Wednesdays until I find another therapy room. Bowen has been in the press recently – an article in Saga magazine and also in What Doctors Don’t Tell You. I can email these to anyone interested in reading them. There is still time to buy Gift Vouchers for both Bowen and Indian Head Massage for Christmas – they make wonderful and thoughtful gifts! Keep warm and safe over the winter! Please feel free to forward this to any friends or family who may benefit from having my contact details! !